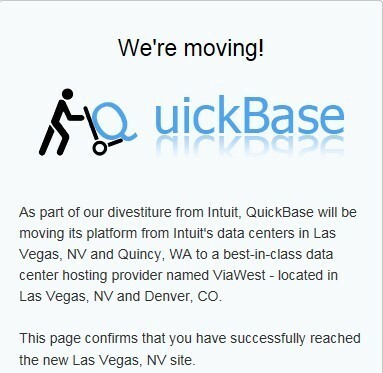 As part of their divestiture from Intuit, Quick Base has announced their plans to move to two new datacenters on May 6, 2017. This move will be from Intuit’s data centers in Las Vegas, NV and Quincy, WA to a best-in-class data center hosting provider named ViaWest – located in Las Vegas, NV and Denver, CO. They are working hard to ensure that the move is smooth and has minimal impact on our clients. There will be NO change in how Quick Base functions or performs and NO change in Quick Base’s availability, disaster recovery, security, or compliance (https://www.quickbase.com/security-and-compliance). Customers who have integrated Quick Base authentication with their own corporate directory using the Quick Base LDAP integration option will need to allow access to their LDAP servers from the new IP addresses Quick Base will use in their new data centers. Please provide the list of IP address ranges below to your IT/Network team to ensure that the new Quick Base servers will be able to access your LDAP servers. Customers who restrict the web sites their staff can access and are using the IP address of the website as the means to restrict access will need to allow the new IP addresses Quick Base will use in the new data centers. Quick Base has provided the test links below, one to each of the new datacenters. If you can click on these addresses and go to them successfully then you do not have to worry about any IP restrictions at your organization. If you are unable to access the expected web pages, please provide the list of IP address ranges below to your IT/Network team so they can update your access list and then try the test links again. In addition to all the planning and preparation designed to minimize any downtime, Quick Base will need to be down for up to 4 hours on Saturday May 5th during the actual move. They will be announcing the specific times for the move by April 5th, 2017. This also allows for Sunday to finish all the post move tasks. Lastly, the new datacenters will provide equal or better service as we have all come to expect from a world class company like Quick Base. Specifically, the new datacenters will have the same failover and disaster recovery capabilities as the current Intuit Datacenters, they meet all the current security compliance requirements and policies, and will have the same or better processing power. This new move is a big step towards Quick Base’s autonomy and will give them the flexibility to make enhancements in the future. Control the Change and Win!